As you can see by the picture, I bake this often and I am a really messy baker! There are oil drops, batter smears and water stains! I could have retyped this, but I love the history behind the paper and the recipe! My sis in law, Yvette, made this for us when she came to visit Bend for the very first time. She had these really cute loaves of bread for us along with a bottle of wine. What an awesome house warming gift! We really love bread, all sorts, and really, really, really, really, really, really love red wine! We drank the wine that night and ate the bread the next morning. 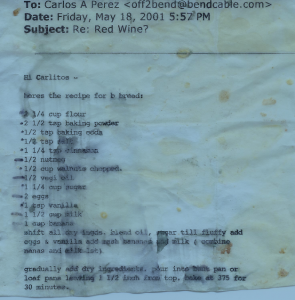 We loved it so much that upon her return to La La land, she found an email from Carlos, requesting the recipe for the bb bread. Yvette is really, really nice and emailed it that evening! and there ya go! By the way, I think it’s really, really cute that his sisters call him “carlitos”. I can’t get rid of the recipe for that reason, too! The red wigglers also really love the banana peels!